DENVER (AP) — The Denver Broncos‘ defensive scheme went perfectly according to script for 3 ½ quarters as they put the brakes on Patrick Mahomes . Then, the Kansas City QB went off-script. All the Broncos could do was chase. 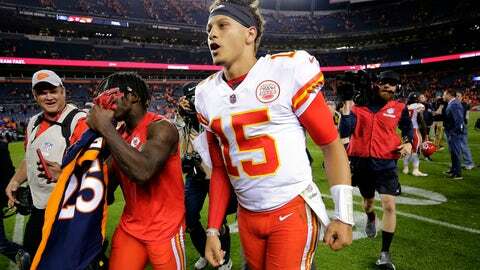 Still, Denver may have just uncovered some semblance of a blueprint for containing Mahomes, who’s been a magician at times in leading the Chiefs to a 4-0 start. Well, as much as a plan can exist for a QB who’s become an escape artist. The Broncos kept him contained in the pocket, limiting him to 65 of his 304 yards passing in the first half, before he busted out with an assortment of unconventional plays. Chief among them, a left-handed pass late in the fourth quarter to Tyreek Hill that resulted in a first down. Mahomes even had Von Miller closing in on him during the play. It was a quick-thinking move to go all ambidextrous to complete a pass. “Everyone should get used to him making good plays like that,” said Broncos linebacker Shane Ray, whose team fell to 2-2. “Unfortunately, it was one on us. Denver led by as many as 10 points in the fourth quarter before things unraveled. Now it’s on to rookie Sam Darnold and the New York Jets next weekend. Joseph doesn’t think the close loss will result in any sort of hangover effect. One positive: The running game. Phillip Lindsay gained 69 yards and Royce Freeman rushed for 67. As a team, they averaged 7.2 yards per carry. But on a pivotal fourth-quarter series — after the Chiefs finished off a 12-play drive with a score — the Broncos went three-and-out. Two of them were pass plays, including Case Keenum being sacked on third down. Punter Marquette King compounded things with a 35-yard punt. A worn-out Denver defense had to go back on the field to stop Mahomes. It wasn’t a good recipe.